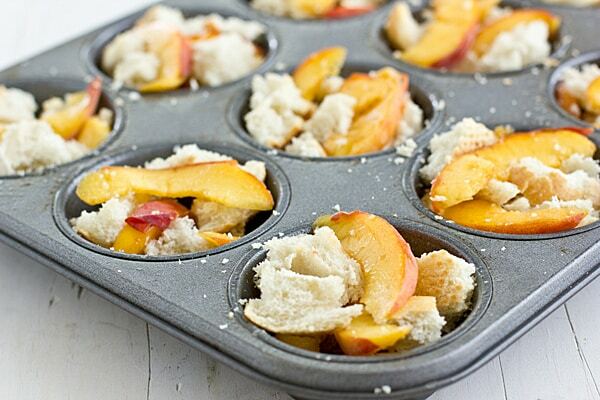 Peach french toast cups…get in mah belly! I wonder if the Mr would give up his peaches for these. Heh heh. Back to your regularly scheduled Poison song. It’s always hair metal in my head, I swear. Hair metal, Vanilla Ice, and Bobby Brown. Not right. If your love for peaches is that strong, you just gotta go with it. They look scrumptious! Peaches, blackberries, blueberries (all three??? CRAZY!!! )… I’m a fan no matter how it’s served. Oh yummy, what a great idea! These would be perfect for my husband! He works 10 hour days and never remembers to grab breakfast. I’ve been trying to come up with easy things for him to eat on the way to work. Anything with french toast in the title is sure to win him over. It doesn’t get much easier than French toast in muffin form! I know, I’ve been making an obscene amount of peach recipes lately. I can’t help it–they are so good! This looks so yummy ! I just love all your recipes and ideas… I’m going to try this out this weekend : ) ! These are so perfect for back-to-school – it’s so hard to get the kiddos to eat anything in the morning. But I have a feeling French toast cups would be a hit. Plus we still have peaches coming out of our ears too! I was already planning to make French toast this weekend, now I’ll be making these instead! Yum! I hope you like them–let me know how they turn out! You are so adorable and so funny!! They look wonderful with peaches! These look scrumptious! My husband loves peaches and I am sure he will enjoy a few of them for the breakfast. 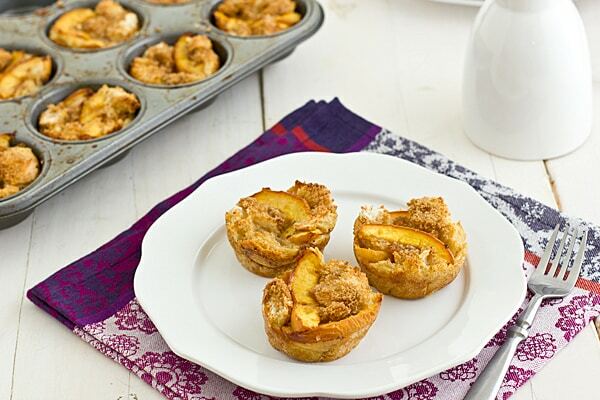 love the idea of the french toast cups! 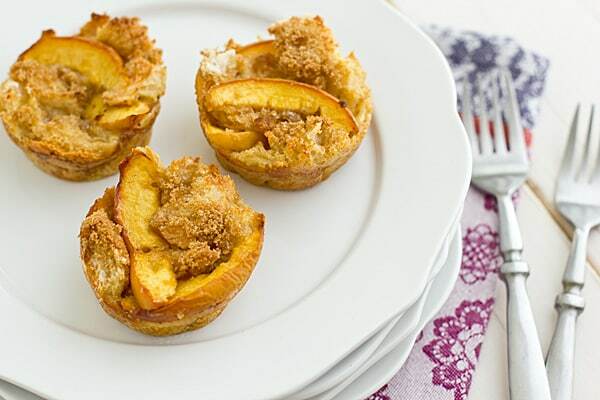 French toast cups are a great idea! 🙂 A perfect little treat for breakfast. I made these today! I saw the recipe earlier on FB and rushed to the kitchen. I used frozen strawberries, because that;s what I had (we’ll do peaches after a trip to the market this weekend.) They are wonderful! I think I’ll add some chopped pecans to the brown sugar sprinkle on top next time. Thank You! Thanks for letting me know–I’m so glad to hear they turned out well with the strawberries! I will have to try that too. And I love the idea of adding pecans! Is it possible to gain weight reading a recipe? I think it just happened to me. Oh my gosh. Well, these aren’t too bad as long as you don’t eat too many. But I have a recipe coming up next week that will definitely make you gain weight by reading it. That’s okay once in a while, though! It really is! Wow, I love this idea. These looks super yummy! 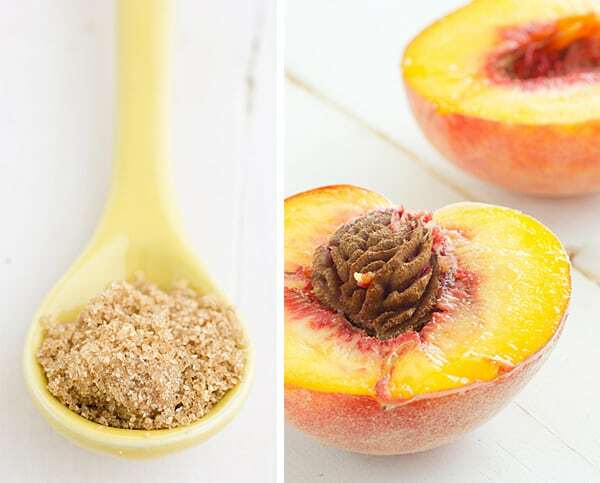 I’ve been saying it so many times… I can’t wait for peaches! I’m still waiting for local peaches, and it’ll probably be a while longer. Can’t wait! This is such a great idea, and I’m so glad you listened to the voice in your head – I would take peaches over blueberries any day! I have a pretty good sized sweet tooth so I think I’d still like them with a good drizzle of maple syrup, but I like that they can be portable too! What a fun idea for breakfast! I love summer peaches and am going to miss them! I feel like I say the same thing every time I come here, but those really look so good! I’m not a huge fan of peaches, however, but the blueberry idea sounds fantastic. These look delicious, my DH is going to die over these! NIce! I’d give my left arm this morning for a couple of those! oh I just LOVE peaches, these look wonderful!